The journey north had been stunning in the gathering gloom and was a taste of the vistas and scenery that we were to experience over the next 2 days; it’s wild, remote sunning landscapes inspire, and in winter weather it is something to experience. Spending the night in Brora a wee town 10 miles south of the village of Helmsdale it was a quick jaunt North and on to this famous river. Having elected to fish the Association water which runs from the harbour 1.5mile upstream, in Spring this can be most likely to produce of all the beats on this 20mile river, famed for its once prolific Spring run like every river it has dropped off in recent years that is as much to do with the pressures on the species and the endless other factors threatening wild Atlantic Salmon than anything else, yet the Helmsdale still manages to consistently produce good numbers of fish. Its location in stunning scenery, it’s history and influence on salmon fishing makes it all so worthy of a pilgrimage, just scanning a beat map or OS map of Strath Kildonan also known as Strath Ullie you can’t help but notice the origin of several famous flies alone that this river has contributed to the sport; the Kildonan Killer , yellow Torransh and of course the legendary Willie Gunn which some credit with having taken more fish than any other fly. There is also a sadder Scottish history associated with Helmsdale, the Strath and Sutherland as a whole but that is another story and I had ventured north to fish. The Helmsdale primary source is Loch Badanloch, 1 of 3 interconnected lochs Badanloch, Loch nan Clar and Rimsdale. These lochs help to maintain water levels in drier times thanks to a Dam, so fishing is an option season long. Picking the day ticket up for a very reasonable £25, generally it’s a first come first served basis but it always worth while to phone a head of time. The Helmsdale is unique in some respect as the waters above the Associations water are a collective of owners that work together in regards to the fishings, allowing their guests to to experience all the Helmsdale has to offer fishing different beat on different days. Similarly the opening week; 11th of January is free, all you have to do is register in advance and on each day of opening week you are alotted a beat for the day, personally I think this is a fantastic idea and allows anglers a taste of a river that might otherwise be out of reach. it also helps to get plenty of rods out in the hope of seeing the first salmon of the season, never a bad thing for a rivers’ reputation. Currently Association day tickets can be bought at the Helmsdale Tackle company shop in the centre of the village but sadly they are in the process of closing their retail shop to concentrate on online sales so where to get the tickets following the shops closure, I am unsure. The Helmsdale tackle company does produce some of the finest flies on the market; beautifully hand tied, so with the permit I bought a few of their classic Willie Gunn copper tube that only 4 days earlier had scored Helmsdales first 2016 springer. A mile by road up Strath Ullie brings you to the top of the Association beat, well sign posted next to a parking place a path leads down a flight of steps to the rivers left/north bank and the 2 most productive pools on the beat; the Flat and Style pools. The clear blue skies of earlier where now a distant pleasent memory, Mother Nature must have seen me tackling up and decided……well you can guess! Howling wind bringing with it sheets of heavy sleet and snow that looked like it was never going to stop, it was blowing 40mph from the Southeast/East straight in my face upstream. Hang it, I hadn’t travel 150miles not to fish! As I threw on my waders above the river Jen took pity on me and asked if I would like some company, someone to hold my net. I was so grateful, as much as I love to flyfish there are times were I question my own sanity and just having someone there with you on the river bank when your fingers are blue numb and you are starting to believe your feet are lumps of ice can make the difference between fishing and sacking to off for the pub. I fished virtually this same set up on all 3 river how ever I did change the fly used, on the Ness the cone head monkey was the go to fly, but I was on new water on the Helmsdale and Thurso so opted for the tried and test Willie Gunn since only days earlier it had produced. I tentatively waded into the style pool the very top pool on the Association water where the water was high with the snow, sleet melt and the colour of an over brewed cup of builders tea. I couldn’t see the bottom, just a peaty abyss it’s because these type of conditions, I always wear a life jacket and carry a wading staff. An unfamiliar river, its bottom and its nature is the quickest way to kill yourself, you go for a days fishing and end up fighting for your life, it may be cumbersome but it could save your life. It soon became apparent that wading just wasn’t going to be an option so I heaved myself from the water and got to laying my first cast and even with the 13ft rod it was easy to cover the whole water, but I have to say that I truly hate Spey casting from a bank and I recently discovered that when the cast was developed it was never supposed to be preformed with in 2 yards of the bank and I can understand why! at the back of my mind there is always a niggling worry that you catching the bank. I could have thrown in an upstream C cast but with the wind it was just easier to limit the time the line was in the air, casting at about 45 degrees across the river the line would land several feet upstream of me but I was determined to fish through the pools and at least give it ago. The river was 18in plus up as I fished through the flat and style pools without a touch and in the two odd hours I had seen several cars with rods on them heading down the Glen and calling it a day. A rather wet and cold Jen doing star jumps by the river sealed for me, we beat a retreat to a great wee café in the village to thaw out. 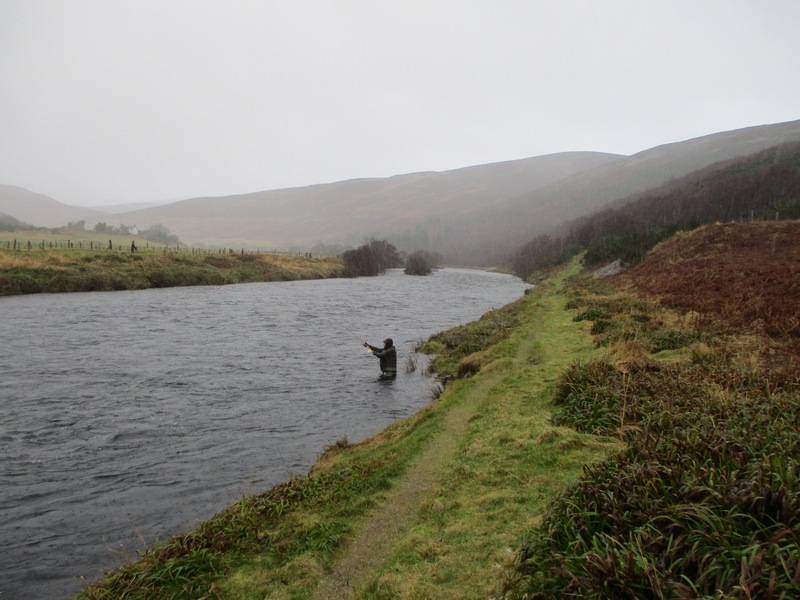 The Helmsdale is such a truly iconic river it was great just to wet a fly on it, a cold and wet day on the river beats a day in the office. I made a promise to myself as we drew out of Helmsdale on to the A9 that I would be back. May is proving a productive month, so come warmer days in the months to come I will be back chasing silver on the Helmsdale. Back on the A9 we had 50 miles left to Thurso and the final river on my northern adventure. It has been almost 10 years since I had ventured this far North on the East coast of Scotland, the West is a different story and is like a second home. I had forgotten how unique and stunning the landscapes of eastern Sutherland and Caithness are! As a recovering geologist the landscape is underlayen by some awesome mouth watering geology, a geology that paved many of the great cities of the world; London, Sydney and many more. You can take the boy out of geology but not the geology out of the boy. But I was here to fish and had left the rock hammer at home, I aimed to fish the lower section of the Thurso Beat 1 the Association water, but the first challenge was finding the shop to buy the permit. A small book shop little more than a broom cupboard the ticket was £40 for the day, which I felt was steep for a river that was not firing on cylinders of late and not a ghillie for help, from the outset I did not feel welcome. I was informed as a guest day ticket I could not fish below the graveyard in essence removing the lowest pools only. The river was beautiful nestled in channel below the rolling plateau like landscape that optimises the this stark beautiful part of Scotland. The river was running a couple of feet above normal, running fast and coloured much like the Helmsdale the previous day however the weather was more favourable, light wind and blue skies only occasionally broken by light snow showers as they drifted through. I chose to fish the well known Salmon pool above the weir, a long deep pool with lovely greasy water and boils which just looked as though it should hold fish, fishing from the West Bank wading was once again out of the question so I stuck to cast of 45-60ft aiming the copper tube Willie Gunn on the edge of the fast water that lay along the opposite bank and fished the fly round through the seam and the greasy water I fished slowly through the pool twice without a touch. I had enjoyed the 4.5 hours on this classic river but no success so with my frustration building, the sky darkening and heavier snow looming I opted to beat the retreat to the hotel and the Scotland vs Wales rugby, so from one passion to another. I alluded earlier to a less than welcoming reception to the day angler on this beat and I have to say it was only this beat that I fished so I cannot comment on the other higher beats . Now I hate to be negative about the locations I fish or the sport in general but I was so disappointed to learn that I could have fished these tidal pools at the very mouth of the river, I was told otherwise and it sadly reflects how some Association waters are managed almost like private thiefdoms who would rather not see a visiting angler. But I do have to say having spoken to the Chairman before we travelled he could not have been further from this, welcoming and very helpful but sadly this appears lacking in the other points of contact for the visiting angler who often pays more for a day than the members pay for a year. It is quickly forgotten that these visiting anglers are a valuable revenue stream for any Association water that allows the members to enjoy reasonably priced season tickets and river upkeep, is it so terrible a thing that a visiting angler catch the first fish or even just sample this beautiful river? because apart from the revenue, these fishers leave with a real appreciation of how lucky the locals are, a tinge of jealously that as a visitor it may only be that once a year that we get to sample the peaty waters. The rugby concluded much like my previous two days fishings, without victory but I had loved every minute exploring a tiny bit of these fantastic classic Highland salmon Rivers. We headed South homewards on the homeward leg, a much needed rest and a chance on my local rivers, now that they were once again open for salmon; the Deveron, the Spey, the Dee and the Don.